If testosterone is the most powerful mass builder, then gram for gram this is the most powerful testosterone. 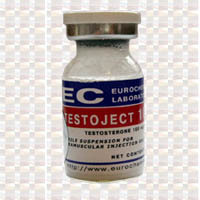 Suspension is pure testosterone and has no ester attached, and thus no ester calculated in the weight. 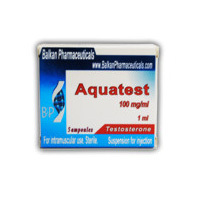 Where 100 mg of a testosterone ester equals 100 mg minus the weight of the ester, 100 mg of testosterone suspension contains an actual 100 mg of the steroid. Very potent and very powerful. Although it is a rather crude compound, it is without a doubt very, very effective. Suspension is not only not esterified, its not even dissolved in oil the way esters are. Instead it is an aqueous suspension, much like the injectable forms of Winstrol/Stromba (stanazolol). Since a steroid, made of cholesterol, is somewhat lipophillic, it does not readily dissolve in water either. Just as with Winstrol, we will note that the steroid accumulates at the bottom, separated from its water environment if the vial is left sitting for a while. So before use a vial should be shaken, which will provide an even distribution, and then drawn out of the vial. It probably couldn’t hurt to shake the syringe again before injecting as well. Because of its water carrier it does not go directly into the blood, but when it does enter the bloodstream it is released quite quickly delivering very high peak doses. It is injected every day, to every other day at the very least. Some seem to claim that water based steroids will still last in the body for several days on end, but this is not a generally accepted, let alone proven fact. In fact while the steroid probably does exert some action for 2-3 days, most athletes will opt to take advantage of the peak dose and inject it daily. If one sees that even a short ester steroid like propionate is injected every day to every other day in most cases, this logic is easy to follow. One reason for the extreme success users have had with testosterone suspension is no doubt the extreme doses used. Where one would take 50 mg of winstrol every day to every other day, suspension is injected daily at 100 mg in most cases. Factoring in that there is more testosterone per mg than in an esterified form, it’s a safe conclusion that this is almost twice the dose of any other form of testosterone normally used. The results are nothing safe of amazing. Using the optimal peak doses of the steroid, weight is gained at an amazing rate and the steroid accumulates faster than with esters, so gains are seen in a lot shorter time-frame as well. Stack that with another base steroid and an aromatizable oral such as Dianabol (methandrostenolone) and one should not be amazed at weight increases of up to 30 pounds in 8 weeks. Because of the high peak doses and the extreme amounts used, the characteristics tend to become more pronounced as well. The muscle gain is usually accompanied by severe bloat and water retention, some adipose storage and the risk of gyno is never too far off. Being a very androgenic component as well, suspension may aggravate male pattern hair loss, cause prostate hypertrophy, increase body and facial hair, deepen the voice and so forth, quite easily, in comparison to other steroids. These all need to be taken into account. Despite its controllable nature and short frame of action, suspension is mostly used for bulking purposes. Even with concomitant use of Proviron, some water retention can still occur. Perhaps due to the extreme doses used. Just as with the water-based injectable Winstrol, suspension too is believed to be able to give local growth if injected in a particular area, which has no doubt increased its popularity. Its slightly friendlier to inject than Winstrol or Propionate, because it has a very small crystalline form that passes through a 27 gauge needle easily. But the injections will still not be the most pleasant ones ever felt. Especially when given daily. I myself do not attach a whole lot of belief to the theory of site injection and local growth, but some big names in this industry such as Bill Llewellyn seem to lend it some form of credibility. So I will not elaborate on this debacle anymore than I have. For those willing to give it a shot, I’m sure it can’t hurt (well it will hurt, but it won’t hurt your gains no matter where you inject it). The number of available suspensions in the world has been reduced to 5, and is therefore not the easiest product to locate on the black market. In Australia the compound can still easily be found, and no doubt a whole host of Mexican imports. Because the crystalline form is quite sophisticated, I wouldn’t dream of purchasing suspension from an underground source, one may be disappointed and literally hurt if trying to inject a cruder form of suspension. I wouldn’t really trust any other form besides the 5 listed above at this moment in time. Because anyone would be hard-pressed to use this particular steroid for cutting, it should really only be administered for bulking purposes. Its not immediately a compound for beginners, it requires some skill. First of all to site inject and rotate injection sites, but also to deal with the occurrence of side-effects, which may be a little more pronounced than with testosterone esters. The compound is best injected daily, using 50-100 mg per day. It is best stacked with other products for the express purpose of adding mass, probably a base compound with a lower occurrence of androgenic side-effects such as Deca-Durabolin or Boldabol (Equipoise) in doses of 300-400 mg per week. On can of course, as usual add an oral bulking agent such as Dianabol or Anadrol/Anapolon (Oxymetholone) to kickstart gains, but testosterone suspension should deliver results in a shorter time-span than esterified testosterones, mostly due to high peak doses and immediate accumulation. Although for best results one would opt to use it for 10-12 weeks, few will last that long with giving themselves daily injections. An anti-estrogen such as Nolvadex is best kept on hand, as there is little doubt that estrogenic problems will occur. Using 30-40 mg/day until well after problems have subsided is advised. Cautious individuals will opt to run proviron or arimidex, aromatase blockers, alongside testosterone suspension to prevent any estrogen from building up. While this will strongly reduce gains, testosterone suspension is still a very adequate compound. Proviron (Masterlone) is to be given preference as an aromatase blocker with all forms of testosterone, but those prone to androgenic side-effects such as male pattern hair loss would do wise to invest in the stronger and more expensive arimidex, since proviron can increase androgen-related side-effects. Testosterone is, next to Nandrolone, the most suppressive drug of natural testosterone. So its an absolute must, especially after long cycles, to include HCG and Nolvadex or Clomid after a cycle. Running HCG for the last two weeks of a cycle and two weeks after in doses of 3000-5000 IU every 5-6 days, and then starting Nolvadex 4-5 days after last shot of testosterone, beginning at 40-50 mg per day for two weeks and then 20-25 mg/day for another two weeks seems to be the best course of action to follow in this instance.